Driving up the hill to Mt. Rushmore, the anticipation was killing me. 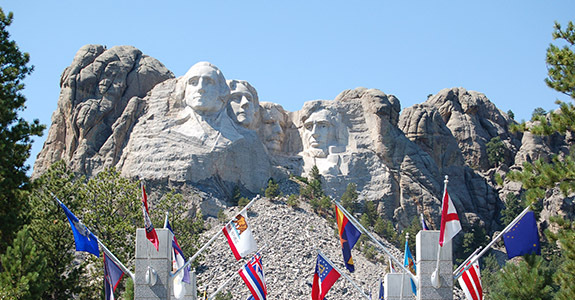 I just could not wait to see those iconic faces carved into the stone face in the Black Hills. Walking up to the viewing area between the flags of all 50 states I glanced up my first reaction was ...oh, they're a lot smaller than I thought. We stood there for a few moments taking it all in and after recalibrating after my initial reaction, I decided it's still magnificent and breathtaking nonetheless, especially when you look at the rock they were carved into. But to truly appreciate the monumental effort it took to create, you MUST go down to the visitor center and see the exhibit explaining how Mt. Rushmore was built. The kids and I were just completely blown away. It was super interesting to see the the original scale models and how they used those models to configure blasting patterns for the dynamite that was strategically placed to get the rough design they wanted. There is a whole display that talks about the dynamite and how it was used but the best part was a fuse box connected to a video screen. When the kids pushed down and yelled "fire in the hole" the video screen showed actual footage of a blast during the construction. Of course my boys had to sit and push the lever about 150 times but it was all good as long as they let didn't break it and let others have a turn when they wanted to give it a try. There was all kinds of memorabilia especially regarding the commemoration. The carving of Mt. Rushmore really was an incredible feat, and none of us would have really appreciated what went into it had we missed the visitors center. On a side note, surprisingly, there is also a wonderful cafeteria on site with really delicious food that I would highly recommend and I don't usually say that about any cafeteria but this was exceptional.